"With a shoehorn in my pocket, I travel through life—always trying to slide in one more object, one more experience, one extra moment . . . "
Here, at last, is a book about clutter that won’t try to convince anyone to change their sloppy ways. Rare to the genre, this is a memoir, not a how-to manual. Instead of offering advice, it is filled with humor and personal wisdom. And unlike most books on the subject, it explores the inner dimension of clutter and leaves the practical suggestions to others. 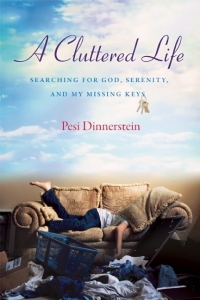 A Cluttered Life: Searching for God, Serenity, and My Missing Keys is the story of Pesi Dinnerstein’s quest to create a simple and orderly life—only to discover that simplicity is not so simple and what constitutes clutter is not always perfectly clear. When a surprise meeting with an old acquaintance on the eve of the author’s fiftieth birthday reveals the extent to which disorder has crept into every corner of her existence, she determines to free herself, once and for all, of the excess baggage she carries with her. Her struggle to get organized—at turns, insightful, unsettling, and wildly funny—illuminates the day-to-day challenges and deeper meaning of a cluttered life. Along the way—with the help of devoted friends, a Twelve Step recovery program, and a bit of Kabbalistic wisdom—her battle with chaos is transformed into an unexpected journey of self-discovery and spiritual awakening.